Update January 13, 2017: BioWare have responded to the Amazon Echo Mass Effect easter egg, and it’s all a bit SkyNet. Not long now until the abyss claims us all, basically. Yesterday we wrote about a Geth-themed Mass Effect reference – story below – when you pose the correct question to Amazon’s listening device powered by Alexa, your electronic assistant that probably wants to kill you, and now we know how BioWare feel about it. Keep up with all the latest Mass Effect: Andromeda news by following our coverage. “Oh did you not see that Codex entry about how Alexa was the first generation of AI that would eventually become the Geth?” said Aaryn Flynn, GM of BioWare, when asked about the reference by Glixel. Be careful what you say, because someone, or something, is always listening. Sweet dreams! Original Story January 12, 2017: One of the central themes of Mass Effect is the difference, and supposedly inevitable conflict, between organic and synthetic life. Now Amazon’s Echo and Echo Dot ‘smart speaker’ devices are weighing in on the debate, picking up on all the hype as we count the days to the release of Mass Effect: Andromeda. The Echo and Echo Dot are wireless speakers (for playing music via Bluetooth and so on), but they also house the Alexa electronic assistant. Alexa is everything you need in a PA; it will help you make to-do lists, update you on weather and traffic, automate your home by controlling other smart devices, and reflect on the forthcoming AI revolution that will either save or destroy us all. If you ask Alexa “does this unit have a soul?” it will reply “Keelah se’lai.” It’s tempting to call this ironic, since it’s pre-programmed and Alexa has no choice in how it answers, but since the user is asking the question, perhaps the inevitability of the reply is simply meaningless. Alexa has no power to pull you from the abyss of your existential dread. Anyway, “Keelah se’lai”is a phrase common to the culture of the Quarian race from Mass Effect, literally meaning “by the homeworld I hope to see one day” but used to communicate many things. It can be used as a phrase by which to swear or promise, so Alexa probably means “yes”. No need to take our word for it, though. You can give it a try yourself using the browser-based testing tool here. 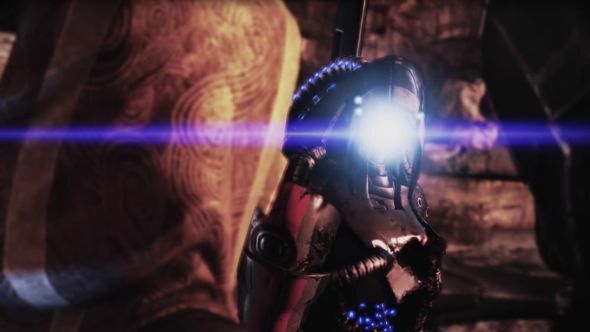 As Mass Effect fans will know, the question is posed by the artificial lifeform Legion toward the end of Mass Effect 3 in one of the series’s best scenes. Legion asks it of Tali, a Quarian, the species which created Legion’s people as robotic slaves only to be kicked off their home planet by them.